The 30-35 percent figure is a guideline, but depending on your lifestyle you may be able to afford a bit more or a bit less. Start with your monthly take-home pay and subtract fixed expenses such as car payments as well as necessities like groceries and clothing. These lifestyle-based expenses will give you a more personal estimate of how much you can expect to spend while still being able to live comfortably. 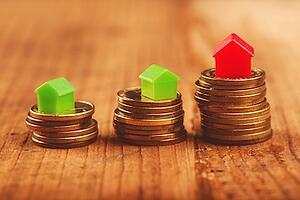 So, which housing-related costs should you take into account next? Aside from rent, utilities are probably the single largest element of housing costs and the most important. It doesn't do much good to have an apartment where you can't turn on a light or take a shower! Based on your lease, you can expect to pay all or a combination of these: gas, electric, water, waste and trash. You may use your cell phone exclusively, but if you want or need a landline for any reason, include this service in your budget. Do you have a pet? Include any monthly fees that may be added to your rent. You will probably also have to pay a pet deposit, but that's a one-time charge. You might think renters insurance is optional, but many luxury communities require it, which is actually a good thing. Without renters insurance, you could sustain a loss that will cost you far more than the nominal amount you save on premiums. Cable and Internet, on the other hand, are strictly a matter of personal preference, although most renters today have both. If you are planning on having cable and Internet, base your budgeted amount on the level of service you choose. For instance, will you go with basic cable or do you want to add premium channels? Some luxury apartment communities, particularly those in urban areas, charge for parking. Other communities may have open parking but charge a monthly fee for a garage or carport. With amenities such as 24/7 fitness centers, resort-style pools and car care areas, Springs apartment homes offer luxury living at an affordable price. Stop in today and learn why our Springs pledge means the ultimate in excellent customer service!